We have some friends/colleagues we work with at church who have 3 very active busy BOY-ish boys....and then came a long a surprise! A little girl, a girly girl, a pink and purple girl. Well this sweet girl turns 4 this weekend and she won a special balloon birthday package from a local company for 15 friends. But, what 4 year old not yet in school has 15 buddies to invite? So she invited other people she knows and loves, and that included our almost 14 year old daughter :) Isn't that precious? And our daughter is really delighted to go. They have this sweet relationship and spend time together. Our daughter was her Sunday School Teacher for a while and every Sunday they chat and *hang out*. I love that sort of thing. Remember at age 4... all those big girls you looked up to? And my daughter bless her sweet heart - really does love her. 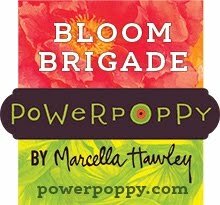 So, you've just got to make a special really girly-girl card right? Well, I took the plunge and could not longer resist some VERY cute There She Goes Stamps, and today I inked them for the 1st time and I'm so delighted to show you! Isn't this adorable? It's a set called Puppy Love, and that little girl just DID ME IN! We don't have pets because of allergies in our house, but the pups are just so cute too, and I know it will be great for kids cards. I'm doing another one for my nephew hopefully tomorrow. Coloring is done with Copic Markers and I added a soft blue sky, some grass blades and shadows. She had to be a blonde because this little 4 year old has sweet golden locks, and I had to add some very girl silk ribbon and pearls. Sorry, I know this picture below is slightly blurry, it focussed on the sentiment and ribbon rather than the image. 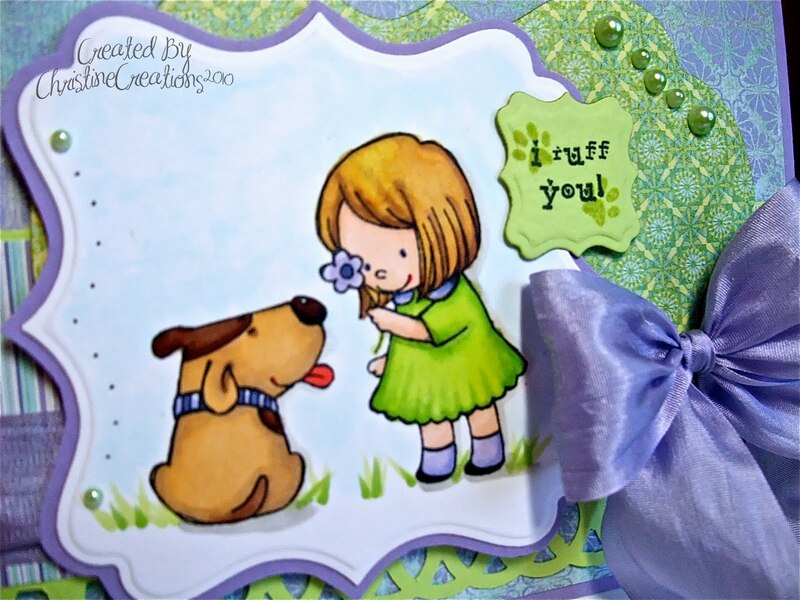 But you can see her dress ruffles and the cute dog prints on the sentiment. I also got some of my brand new Spellbinders today! Woo Hoo I was so excited! This is Labels 16 and Labels 14. The papers are Memory Box Enchanted. Very fun. Thanks for stopping by everyone! I do remember those big girls... they were my sisters. I was the way tail end of 6 and I had 4 very much older than me sisters. Well it seemed that way when I was 4. Now I realize that they were only barely in double digits themselves. How our perspective changes. You must be so proud of your sweet daughter and her wonderful gentle spirit. Your card.. that image.. absolutely precious. This is totally ADORABLE Christine! LOVE the colors and your coloring is AMAZING!!! SO glad you caved and got some TSG stamps...you work MAGIC with them!! Great card - I just love the layout you've created on this card. Such a beautiful color combination. I also have this stamp set and just love it. 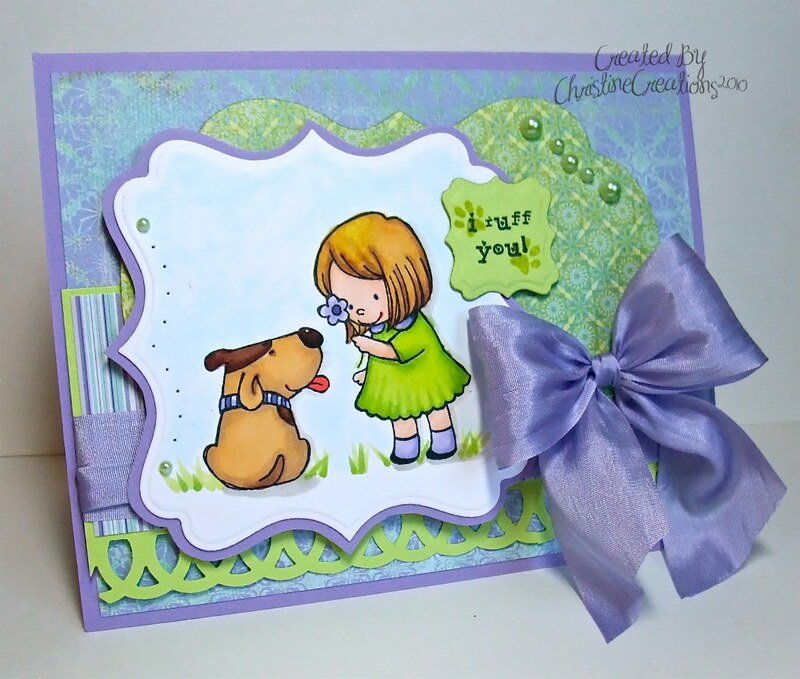 Thank you for sharing--i LOVE this reminds me of my little one and our 2 pups :) Wonderful color combo and design. What a precious daughter you have. This is one little girl who will remember her special friend. Your card is perfect and so cute. Your daughter is a blessing. Aw!! This is the sweetest Christine!! I so love your coloring and that adorable image. The colors and the bow are stunning!! I adore this creation!! The little four year old will love this. What a sweet daughter you have...but that is no surprise...just look at her mom. What a GORGEOUS card!! 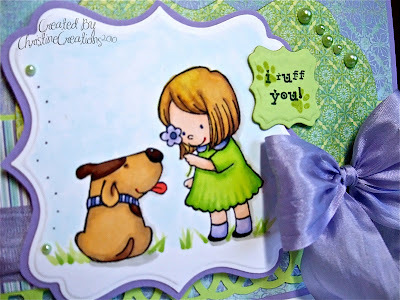 Love seeing you use TSG stamps...yaaay!! I love your work!! What a darling card! I am so relieved that you went with purple and green instead of pink and purple, as I am not a girly-girl! This color combo is so fun and fresh! Awwww...so very cute in every way!